The Middle East is famous for its boiling hot summers and the people who live and work here have only a few limited options to escape the sweltering heat. One of these options is the Wild Wadi Water Park. One of the premier water parks of the Emirate, Wild Wadi boasts innovative rides for all ages and provides a unique experience for the people. The Wild Wadi Water Park is situated in front of the third tallest hotel in the world, Burj Al Arab and the Jumeirah hotels, the rides in the water park provide stunning views of the hotels, the sea, and the entire city. It is located on Jumeira Road, Umm Suqeim 3 - Dubai, which is very much located in the middle of the city so getting here isn't a problem. But it isn't accessible from the public transportation except for the taxis. The theme of the entire park is based on the tales of Juha, a beloved character from the Arabian Folklore. Wild Wadi in Dubai, offers the wildest, the most exhilarating and the best selection of rides in the country. Truly, one day spent here is just not enough. There are kids? activities and an entire pool dedicated to them; there are adrenaline-fueled rides for thrill-seeking junkies and aquatic roller coasters. Apart from the long list of the usual rides, Wild Wadi offers the ultimate surfing experience. Timings change every month, but broadly, the park is open from 10:00-19:00. Timings during the holy month of Ramadan change and is closed on Fridays during Ramadan. However, on regular Fridays, the park is open from 10:00 - 22:00. Thursdays have a slightly shorter duration from 10:00 - 18:00 but Thursdays also host 'Ladies Night' and are called as 'Women's Wadi' which is from 22:00-00:00. This ride is one of the main reason many get lured to Wild Wadi. This is the tallest, fastest free-fall slide outside the Americas. One climbs the 32m tall tower and can breathe in spectacular views of the Burj and the serene beach and at the top two capsules await your arrival at the top. Now imagine the platform you get on, suddenly slips, and the gravity takes control and lets you experience a whirlwind ride. Surreal isn't it? Well, surreal is exactly what you get when you go down at the speed of 80km/h of the 120m tall slide! This is one of the fastest 'aquatic roller coaster', which is a fancier version of saying jets-aquatic roller coasters. Is one of the thriller rides here comprising of two large spiralling downhill water slides with a looming bowl, and ends with you being splashed in a mini pool exclusive for this slide. If you thought the previous slide was a thrilling ride, then this one will blow your mind away. Tantrum Alley not only has two large downhill spiralling water slides but also three tornadoes in between, which literally would give a whirlwind experience. Juha's Dhow and Lagoon is one of the highlights for the kids and the families with the tiny tots. It is a family interactive water-play structure. It is large colourful and vibrant area which beams with tonnes of kids activities, water guns, racing slides, there are even a few slides for babies, and a huge dumping bucket which tumbles water down every two minutes, making you laugh along with your child with glee. One of the only disadvantages of living here is that there are rarely the big waves needed for surfing. But when you do crave surfing, Wild Wadi got you covered! 'Wipeout' and 'Riptide' are one of the only four such rides in the world, providing you not only the ultimate surfing experience but also a unique one. Designed by Thomas Lochtefeld, an American Surfing Enthusiast, and the Wipeout works by shooting out more than seven tonnes of water per second, at a thin sheet, foam-like, structure, producing a realistic wave. This wave effect is ideal for surfing (body boarding and knee boarding). The rates are priced according to one's height. People taller than 1.1m have to pay AED 310 (approximately INR 5,500), and people below 1.1m have to pay AED 260 (Approximately INR 4,500). For the UAE residents, the pricing tends to be lower. You can book from their official site to save AED 40. Children aged two years and under are allowed in for free, provided you have a valid ID. If you are a guest staying at one of the Jumeirah Hotels, then your entry is complimentary! Lockers here come in all sizes and are available in the range of AED 45-85. Towels are also rented here for the price of AED 40. Appropriate swimwear is supposed to be worn at all the times while in the waterpark. The swimsuit shouldn't have any metal buckles, zippers, buttons or snaps that could potentially damage the slides or hurt the fellow swimmers. Burkinis (Special swimwear with hijab for Muslim Women) is available in their retail stores and is allowed inside the Wild Wadi Water Park. Though there are adequate seating arrangements, Wadi cabanas are available for providing you with an ultimate feeling. There are a total of six cabanas in the park, which are available for an additional fee. One cabana can house eight guests. It offers secluded and private seating for you to escape the bustling crowd and interact with your loved ones. There are four complimentary sun loungers under the tent, complimentary towels are also provided, and the guests get VIP Fast Pass, which helps you to escape the long queues of each ride. Three restaurants offer continental cuisine and two snack bars located all over the park, so you're never too tired to play. Where to buy souvenirs from? Shop for the lovely souvenirs at the two gift shops located here. 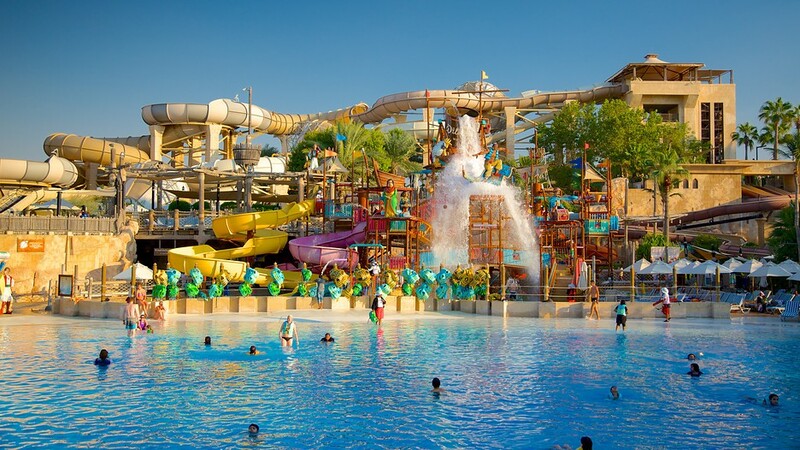 Operated by the Jumeirah International, Wild Wadi is a favourite among the residents because of how compact it is and that there are rides to suit all the needs and all the ages. It has a heated and cooled wave pool, various eateries, two artificial surfing machines, gift shops, and the staff here are hospitable. It is then a no surprise why this park attracts millions of tourists and residents every year. The gorgeous views that one gets when on top of a ride, is just a bonus! Wear the swimming costumes at all times especially on the rides; you won't be allowed without one. Several rides are harmful and thus are not recommended for the pregnant women, the disabled people, and people with heart/back conditions. All the rides have information/instructions in the queue. No eatables, except for drinking water, are allowed inside the park.